Easily see which products to pull and quickly refill shelves from behind for a continuous flow. When the bottom shelf is reversed, it's easy to return cartons for replenishment. Quick to set up, no tools needed. Standard bins, cartons and containers fit perfectly. Moves product to the pick-point more efficiently. 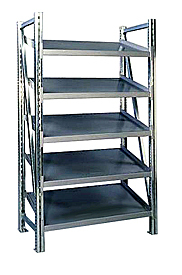 Frequently used in lean and straight-line processes due to its easy versatility. Product slides down slanted shelves in an orderly fashion right to the pick face while improving utilization of the cube. Improve access to products, increase productivity through more efficient flow of product, and aid your pickers and assemblers by delivering the parts right to their location. Tilted at an angle, product slides down in an orderly fashion right to the pick face. Plug in these quick to add drop-in shelves available in single and double depths as well as straight and tilt configurations. Shelves come complete with beams and side guides. Create exactly the kind of product or parts flow you desire.